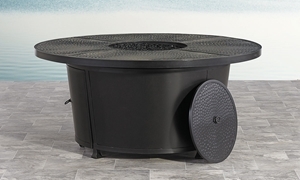 Heavy-duty cast aluminum fire pit in a versatile matte black finish with 44-inch square top featuring lattice detailing. 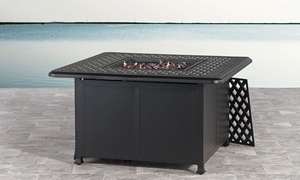 Heavy-duty aluminum fire pit features 54-inch round hammered top, push button ignition, and reusable, smoke-free glass beads. 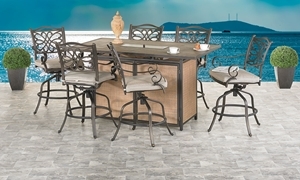 6 heavy-duty aluminum stools with UV-resistant cushions surround a pub height fire pit with 72-inch tile top and storage base. Sofa and armchairs feature all-weather wicker in a chic banana weave, accompanied by three nesting brushed bronze occasional tables. 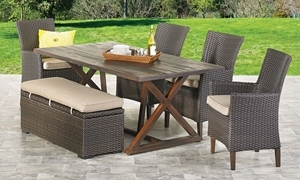 70-inch table & 4 resin wicker chairs with base and legs in a brushed copper finish. 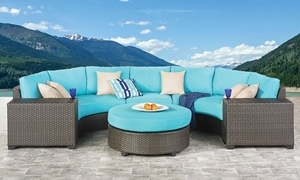 Includes storage bench and UV-resistant cushions. 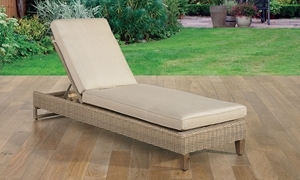 83-inch chaise lounge offers luxury comfort with memory foam cushions atop a frame covered in hand-woven all-weather wicker. 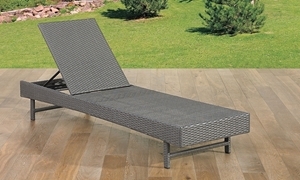 A charcoal grey finish lends a modern touch to this 80-chaise crafted from hand-woven all-weather wicker over a durable aluminum frame. 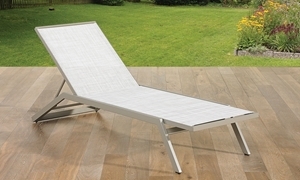 Adjustable 80-inch chaise lounge features a sleek and shiny brushed aluminum frame and neutral fade-resistant outdoor fabric. 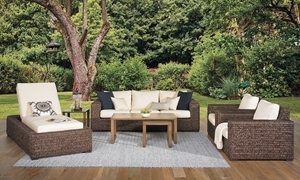 Sectional and ottoman with bright, fade-resistant cushions and two side tables crafted from hand-woven all-weather wicker. 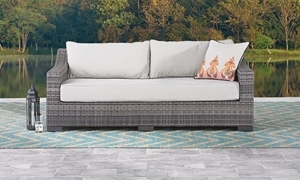 Sectional in hand-woven all-weather wicker provides seating for up to nine people with deep cushions in fade-resistant fabric. 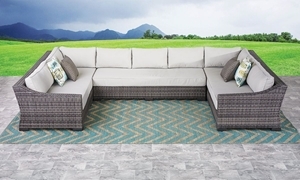 Sloped track arm sofa in tonal brown all-weather wicker features deep seat and thick back cushions covered in UV-resistant fabric. 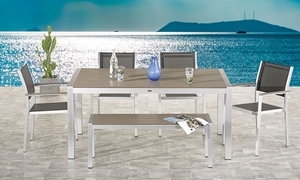 66-inch table, bench and four chairs feature minimalist aluminum frames in a shiny nickel finish accentuated by durable plank details.